Magherafelt�based the Henry Group, a leading, privately owned construction and manufacturing organisation, hosted a visit from the Finance Minister Simon Hamilton today as part of �Minister on the Move� � a series of events by Northern Ireland Chamber of Commerce and Industry in partnership with British Airways. ' Fifty local businesses were invited to put their questions to the Minister and tour the Henry Group�s facilities in Magherafelt as part of the initiative that will see the Finance Minister meet with a wide range of companies across Northern Ireland throughout 2014.' Pictured at the event are Brenda Morgan, British Airways Partnership Manager; David Henry, Managing Director Henry Brothers; Finance Minister Simon Hamilton and Ann McGregor, Chief Executive NI Chamber. Magherafelt based firm Henry Brothers has reported a 30 per cent drop in turnover following the company’s strategic deicision not to tender for “cut-price” work. Turnover at the firm fell from £45.8m in 2014 to £33m in his latest accounts, but pre-tax profits showed only a slight fall from £1.2m to £978,744. In a report filed with its accounts, directors at Henry Brothers said it sought out only high quality work and that it would not buckle to pressure to submit tenders at a low - and sometimes loss making - cost like some of its competitors had been forced to do to stay in business. “The directors have continued with the strategic decision not to pursue cut-price bids, despite the actions of many of the company’s competitors, who have continued to bid at unsustainable levels, resulting in negative margins,” the report said. Henry Brother has worked across the commercial, defence, healthcare, education and industrial sectors. 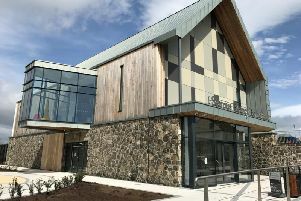 It has, in the past, completed work on HMP Maghaberry, Omagh PSNI station, the listed Union Road Presbyterian Church in Magherafelt, Antrim Castle Gardens, Holywood Baptist Church and Lanyon Place in Belfast. Deals across the water include a £12m contract to build a STEM lab at Loughborough University, West Acton Primary School in Ealing, London and a firearms training centre at Scotland’s Royal Navy headquarters - also the base of the government’s Trident missiles. Staff members at the construction firm has also fallen from 173 to 158.